Hi guys, just a quick post today as I'm about to rush off to a local car boot here in Munich - hopefully I will uncover some last-minute treasures before I return to the UK on Monday! 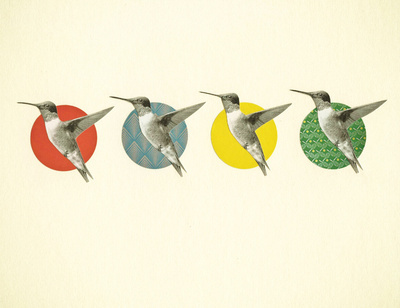 But before I go, I want to share with you a piece of art I recently came across on the Minted website. I've been looking for a piece of art for my flat for a very long time but have been struggling to decide on the perfect piece. It's got to be something I love but also something that I can live with day-in and day-out! 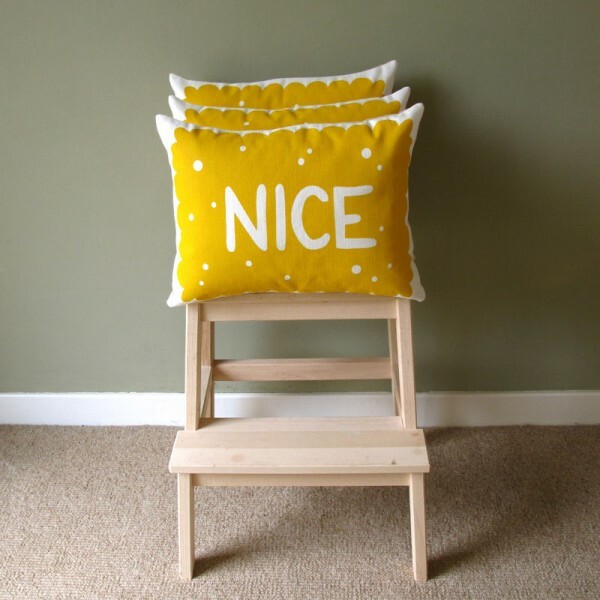 That's why I was so pleased when I came across this lovely yellow typography print by Wondercloud Design. Not only is yellow my current favourite colour (it's so happy and bright!) but also the message is sweet. I won't lie, it's very pricey for a print, but art is such an important (and noticeable!) part of a room that investing in something you love will be worth it in the end. 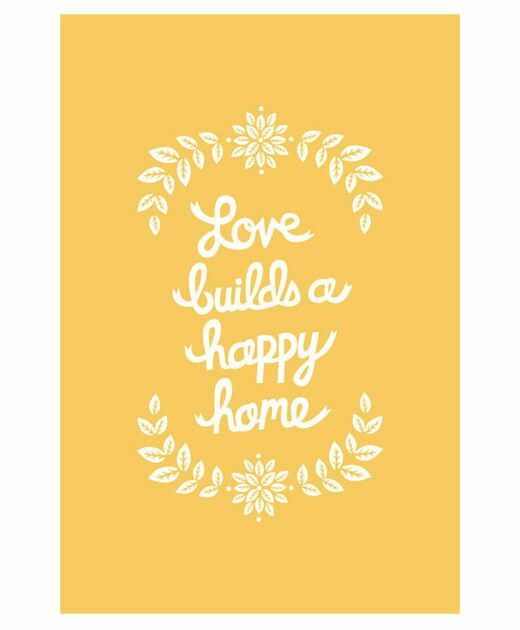 The 'Love Builds a Happy Home' print is available in yellow, ivory and duck-egg blue and comes in seven different sizes from 7''x5'' to 44''x60''. If you haven't checked out Minted before do have a pop over as they are a great place to discover new art and they feature hundreds of independent designers. Hope you all have a fab weekend and hope to see you on Monday! 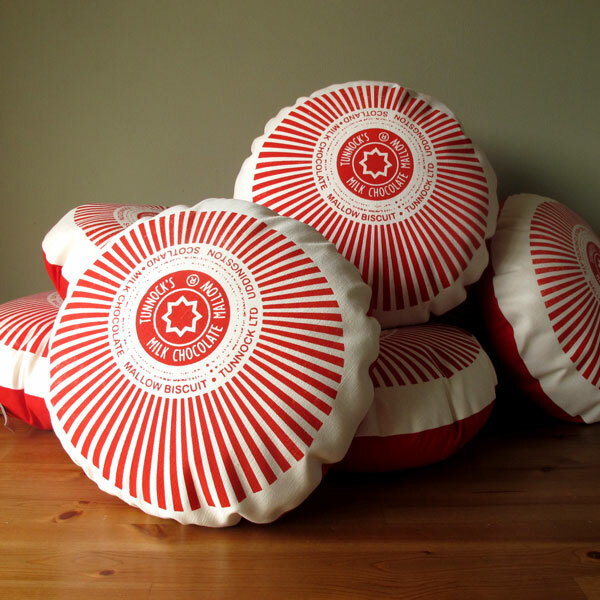 Scottish design seems to be undergoing a resurgence of late. Donna Wilson and Papa Stour are just two examples of how Scottish talent is becoming a major player in the design world. 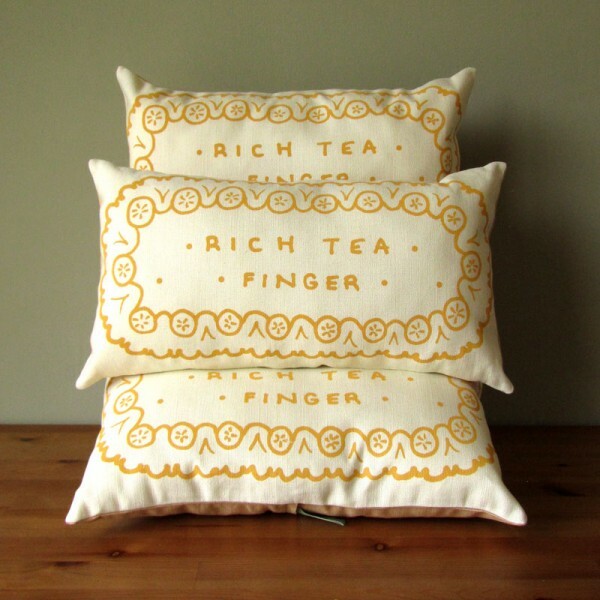 Designer-maker Nikki McWilliams is another name to add to that list. 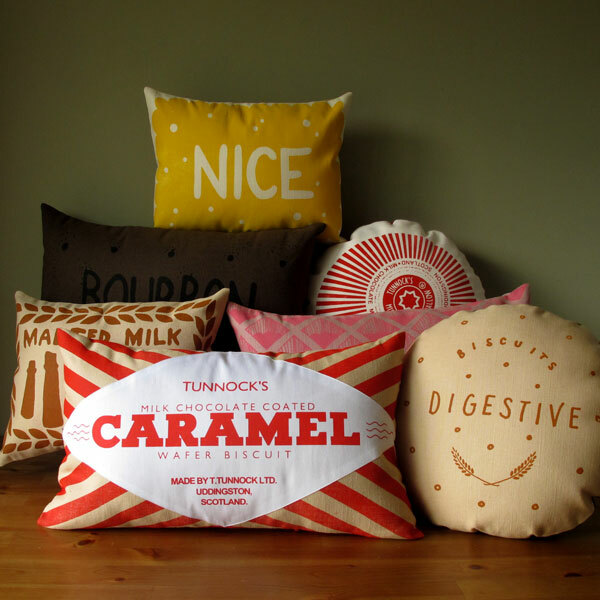 Based in Dundee, Nikki makes fun accessories for the home and body which all have a 'tea-time' theme. 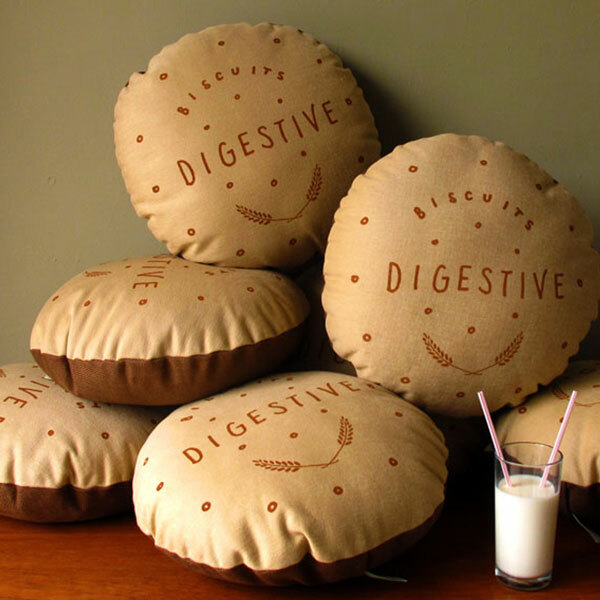 There is a fun range of cushions based on classic British biscuits, delicate art prints and cute brooches. 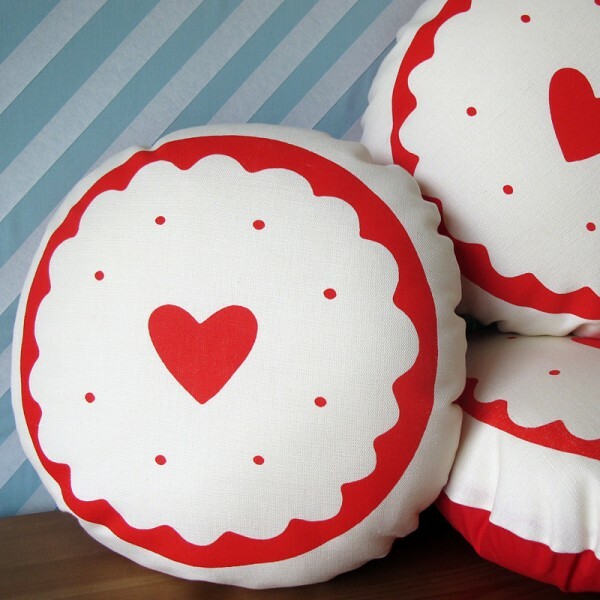 I'm in love with the Jammy Heart cushion, not only because they were my favourite biscuits as a child, but also 'cos it's a cheery and bright design. I've only featured the cushions on this post but here are the links if you want to view her brooches or her art prints. Cosy interiors fit for autumnal weather - take a look at the latest collection from Toast. Doesn't the floral bedlinen in the first image look beautiful matched with the striped pillows? So cosy and inviting. This is only a small selection of what's available, there's lots more on-line including wicker storage boxes, storm lanterns and chunky knit socks. Head over to their site to view their lookbook or go shopping. 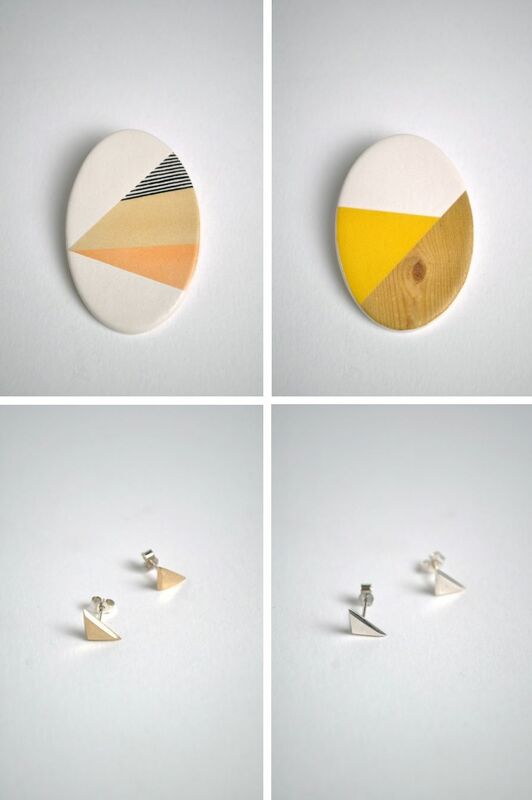 I found these pretty geometric jewellery pieces at the British department store The Hambledon and wanted to share them as I thought you'd love them as much as I do. The sweet triangle and hexagon pendants, brooches and studs are bang on-trend and are reasonably priced too. 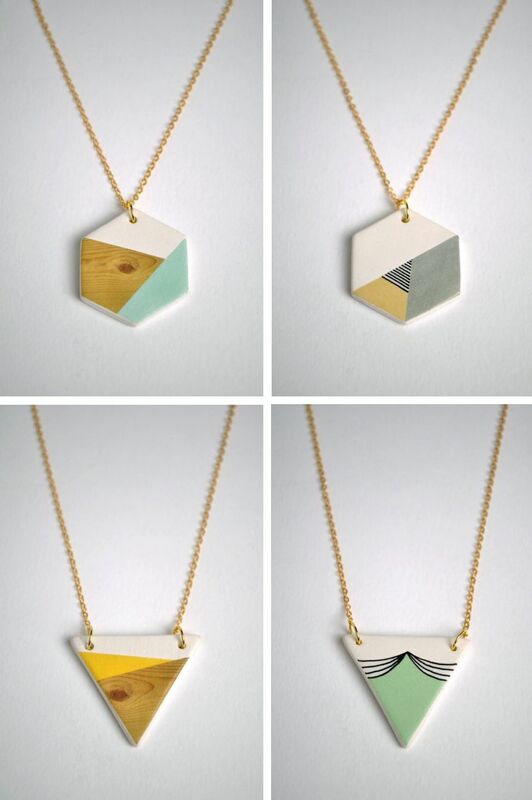 The painted necklaces are £24.95 each and the sweet triangular studs are £15.00 a pair. There are some lovely solid silver triangle pendants too which are worth a look. The Hambledon is a bricks and mortar store in Winchester, Hampshire, but they have a great website (easily navigable with pretty photography!) and ship worldwide, so make sure you have a peek this weekend! 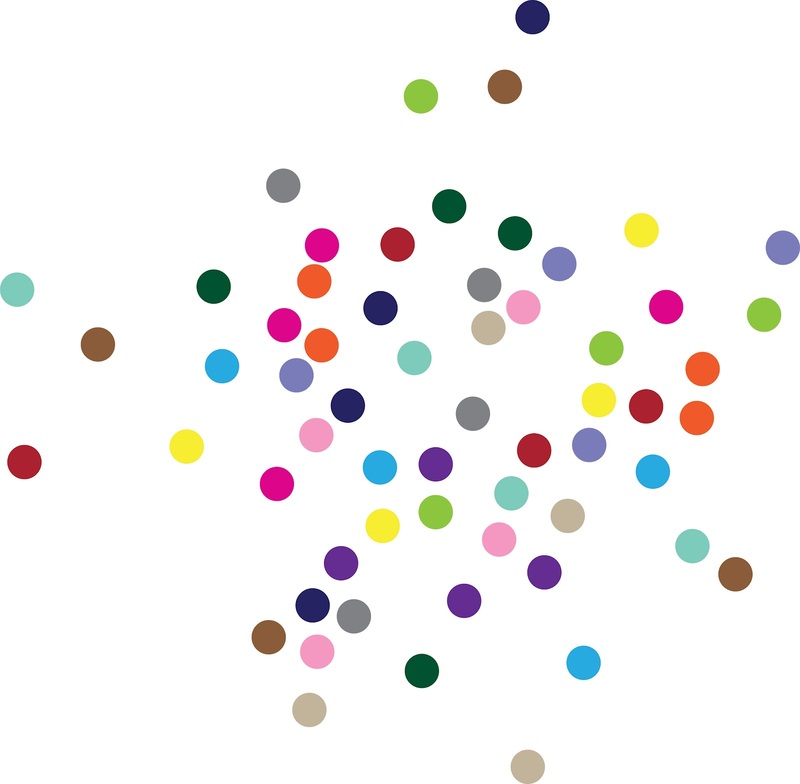 This week I was introduced to the Danish brand Umlaute Designbureau (via the blog Fjeld Borg) and discovered these colourful stick-on polka dots, called POLKAlove! 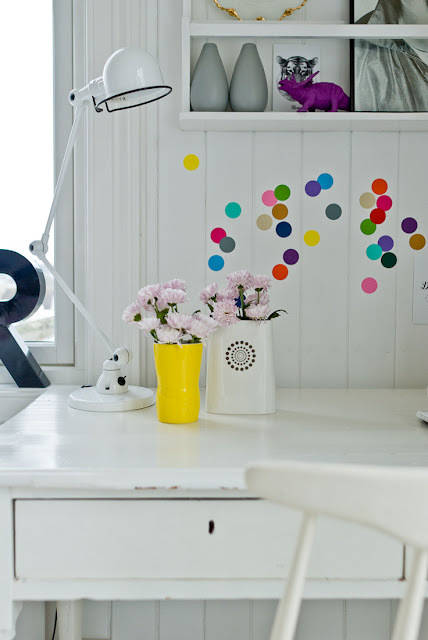 They are self-adhesive multi-coloured dots which can be used for decoration all over the house or for craft projects. I think they're fab and add a nice splash of colour to a room. Here they are on the wall in Fjeld Borg writer, Ingrid's, work area. Don't they look great? They come in a pack of 60 with 15 different colours with each dot measuring 3.5cm in diameter. The best bit is that they're re-usable to you can stick and un-peel 'til you've got it just right! To buy, head over to Umlaute Designbureau's on-line shop. As you all know the autumn issue of 91 Magazine is out and it's possibly my favourite issue yet. It's full of vintage homewares, pastel-coloured home tours, fabulous interviews with the most inspiring, creative women and lots of stationery. Love! I thought I'd share a few tear sheets with you today of one of my favourite articles in the magazine. 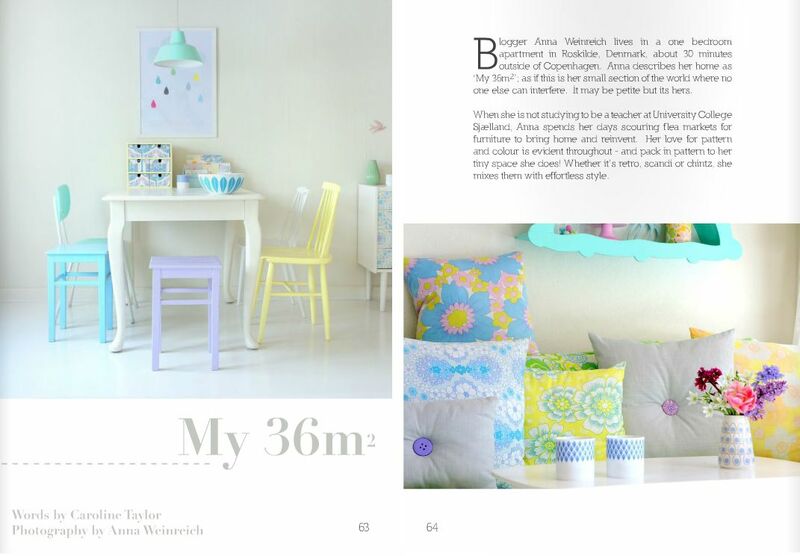 The article is called 'My 36m²' and is an interview and home tour with Danish blogger Anna Weinreich. Anna has got the most beautiful home, full of bright pastel accents and lots of flea market finds and it was lovely reading about her home and how she put her beautiful space together. 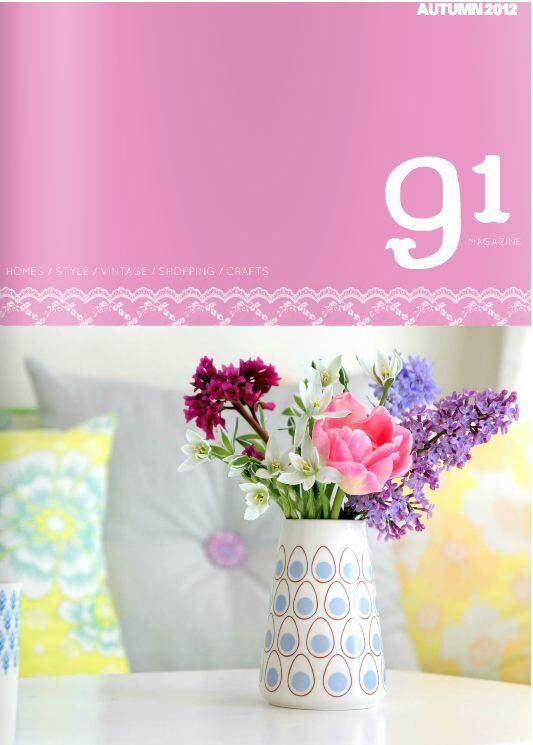 There are lots of other inspiring articles in the magazine from bargain-hunting tips to neon DIYs. Have a read yourself here. P.S. It's also 91 Magazine's first anniversary issue - congratulations! 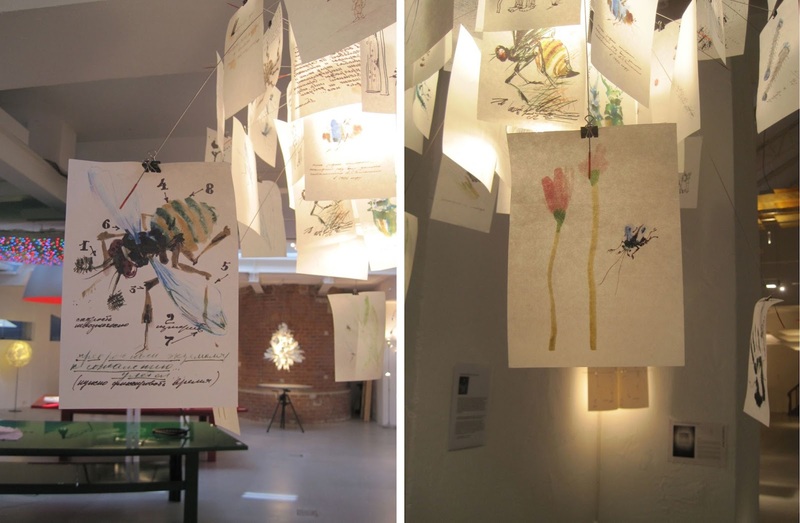 Last Friday I had the pleasure of visiting the Munich showroom of German lighting designer Ingo Maurer and I wanted to share a few images of my day with you. If you are unaware of Maurer then read on as his work is not only beautiful and inspiring, but also functional and used by design lovers all over the world. 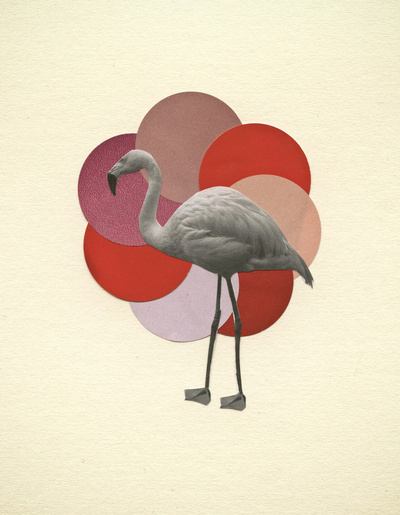 Maurer began his career by studying graphic design in Munich. In 1960 he moved to America and worked as a freelance graphic designer in both New York and San Francisco. Eventually Maurer returned to Munich and in 1963 founded the company 'Design M', which would later become 'Ingo Maurer GmbH', which developed and manufactured lamps. 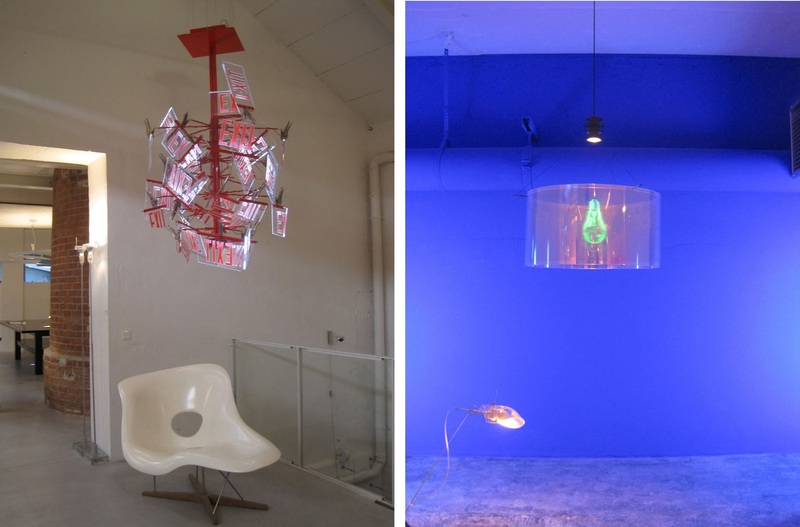 His career took off when one of his first designs, 'Bulb' (1966), was included in the design collection of the Museum of Modern Art. The 'Bulb' design is still very iconic today and many lights have been produced since that emulate Maurer's original design - largely due to a renewed popularity of the exposed bulb in interior design. 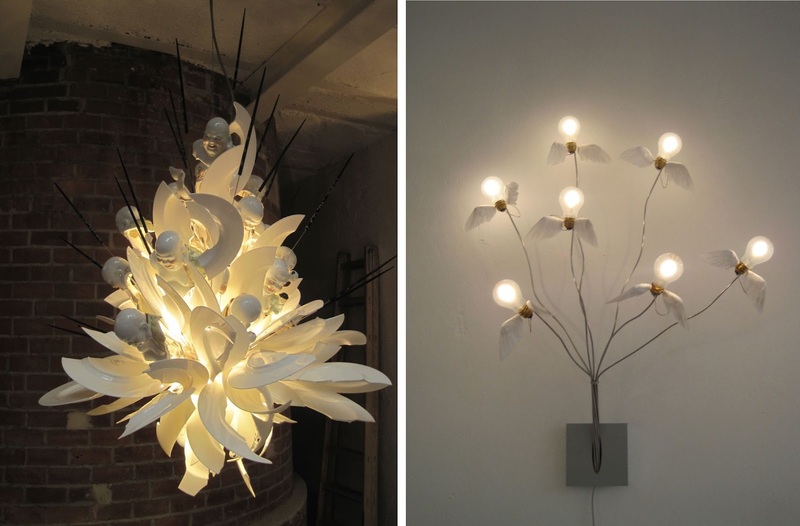 As well as creating lighting products for us to buy, Maurer also creates light installations for both public and private spaces and also takes commissions. If you've been to Munich before then you've probably been to Münchner Freiheit tube station and have seen the blue illuminated columns - this was one of Maurer's projects in 2009. Maurer has two showrooms worldwide, one in Munich and one in New York. His showroom in Munich holds his entire lighting collection. There are over 100 products on show including prototypes and one-offs. It's set in a pretty ivy-covered building just off the busy street of Kaiserstrasse and is well worth a visit if you are planning a trip to the area. While I was there I took a few snaps of some of my favourite pieces, I hope you like them too! 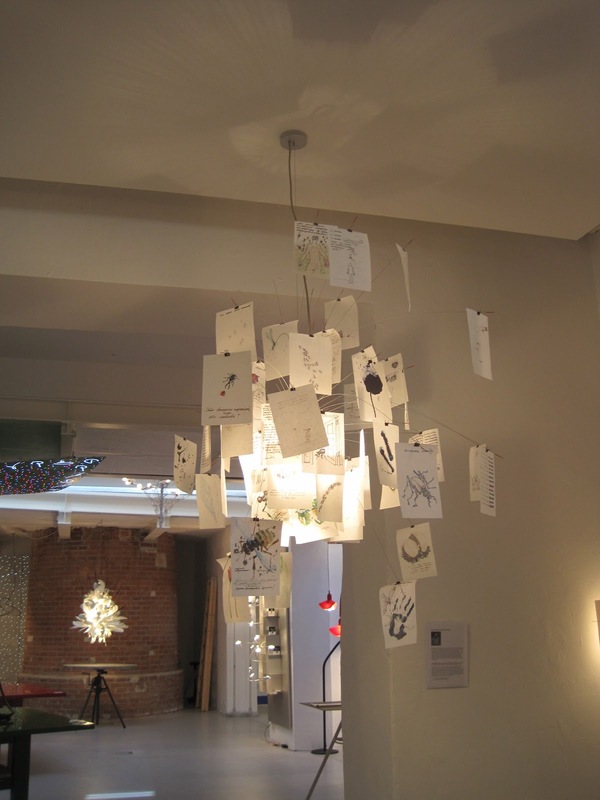 If you are interested in any of these designs they are, from top to bottom: Johnny B. Butterfly, L'Eclat Joyeux, Seven Off The Wall, Bang Boom Zettel'z, Canned Light, Exit, the hologram light Wo Bist Du, Edison...?, Ingo Maurer's signature Zettel'z chandelier, two close-ups of the Zettel'z chandelier. To find out more about Maurer's work and designs, head over to his website where all his designs are catalogued. Pink ombré is everywhere at the minute. 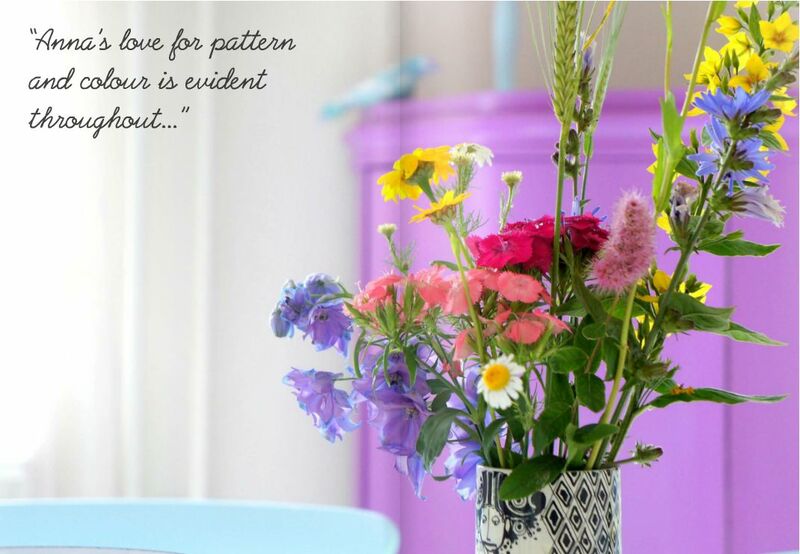 The lovely design can be found on tablecloths, curtains, furniture, cushions, crockery and even cake! Yes, the graduated colour design has taken us by storm. 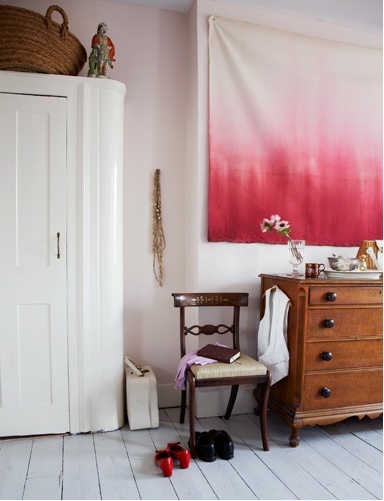 Despite the intensity of the shocking-pink colour, this trend is actually very user-friendly and can be used quite subtly in a living space. I love this trend and can see it sticking around for a long time. A look that I really love, and one that is really simple to do yourself, is this wall hanging below. I love how the simply dyed sheet looks like a piece of art. It's a very cheap to create and is easily changeable too. If you were after something a little subtler though, how about these accessories? The storage container is from Varpunen, the wooden kitchen utensils are from Shelter Black, the cushion and curtains are from Esprit and the wicker planter is from Ikea. What a gorgeous trend! 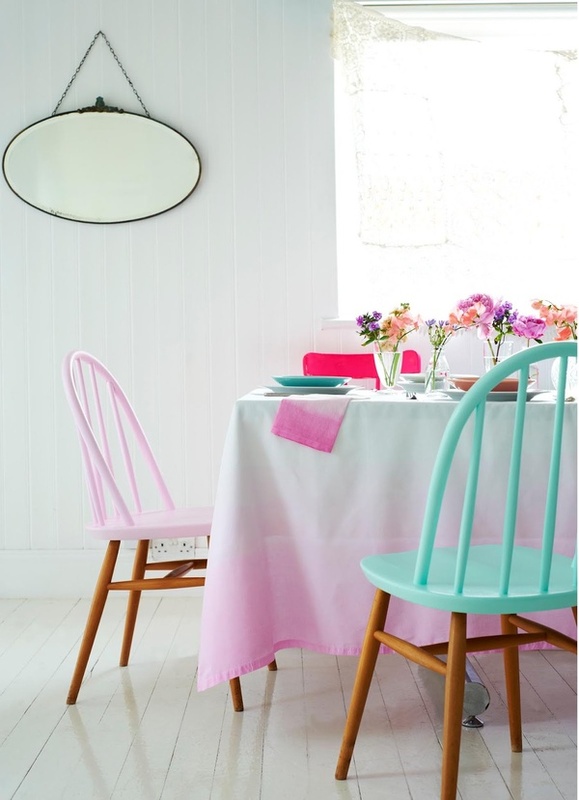 The pretty pastel styling above is by Charlotte Love and you can see more images from this shoot on her blog. Her theme for the shoot was Pastel and Ice Cream and I think the images are LOVELY. Morning! This week's interior inspiration comes in the form of some colourful staircases. Not currently having my own set of stairs has meant I haven't given them, or how I'd decorate them, much thought. But having seen a few images on Pinterest, and having done a bit of research, I'm now prepared and inspired for when I do finally have a set to decorate myself. 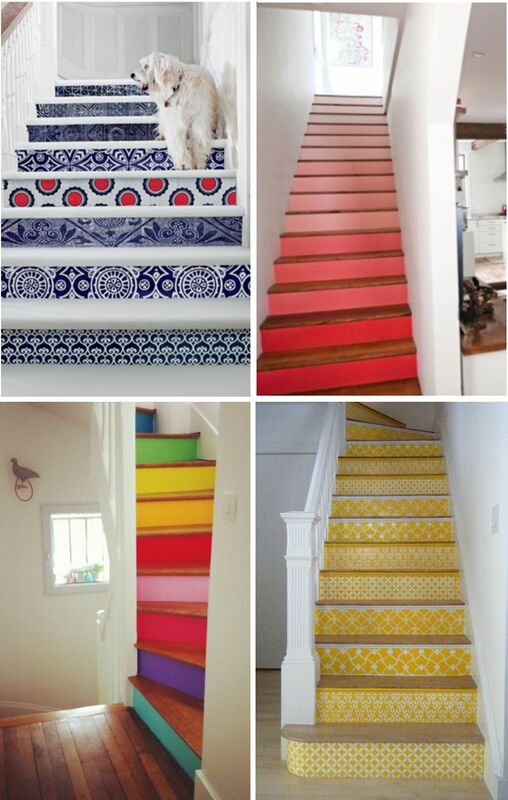 My favourite design has to be the rainbow colour-blocked stairs, they're so bright and cheerful! 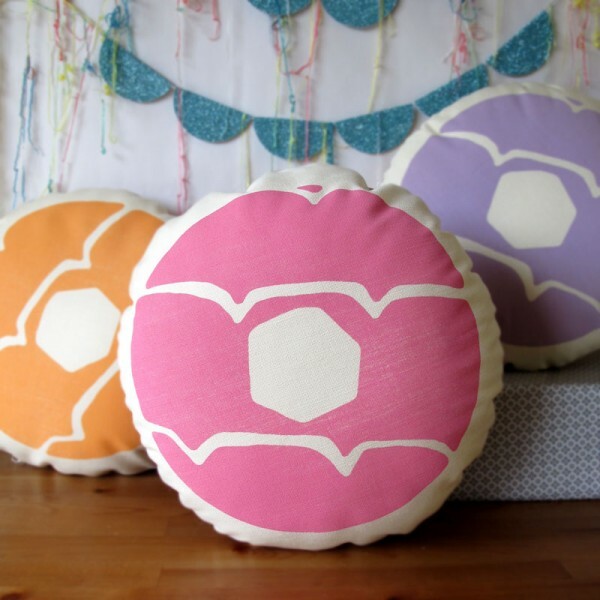 Colour-blocked, stencilled or carpeted: which style do you like the most? Autumn, my favourite season, is finally here. For me this means windswept walks in the park, warming foods and cosy nights in, but it also means it's time for some new things. Below is my autumn wardrobe wish-list for the new season, including a gorgeous cape from the new Alice Temperley collection at John Lewis. I posted about a similar cape back in August so I'm really pleased I've managed to find one just like it on the high street. Also on my list: this pretty tea dress from Topshop, which I'll wear with thick black tights, a handy black satchel, some sparkly nail polishes and some new boots. If I manage to get all of these then I think that'll be me sorted for the new season. What about you? Have you got your eye on anything? 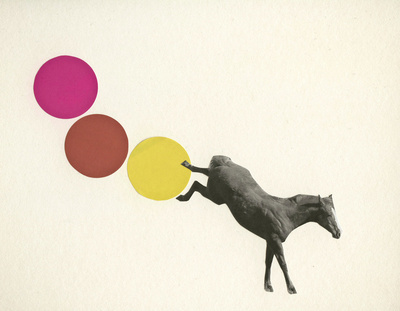 I've posted before about how much I like photographer Cassia Beck's work and these new prints only second that. 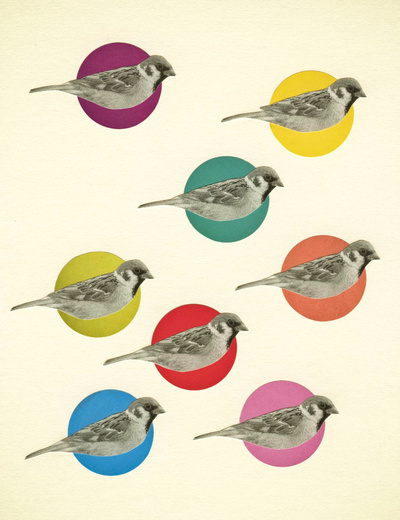 There are lots of different art prints in her Society6 store, but the range that has caught my eye this time are these retro-style images with bright colour pops. Her work never fails to bring me joy in one way or another. 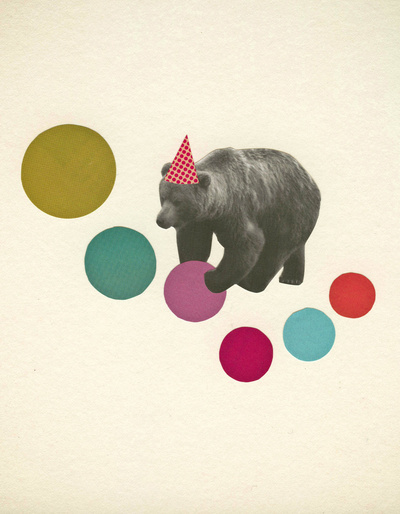 Whether it be from humour (I mean, there's a bear in a party hat!) or on a more visually aesthetic level, with pretty pastel flowers swaying in the wind, I love it all. Make sure to check out her Society6 page where you can get these prints, as well as many others, framed or on iphone cases, laptop cases and greeting cards. Morning! Hope you are all well? What did you get up to over the weekend? We had plans to go to Munich's largest flea market at Riem on Saturday and then visit Neuschwanstein castle on Sunday, but unfortunately the weather had other ideas. It poured it down for two days solid so I suppose they will have to wait until next week! I hope you had more fun wherever you were? 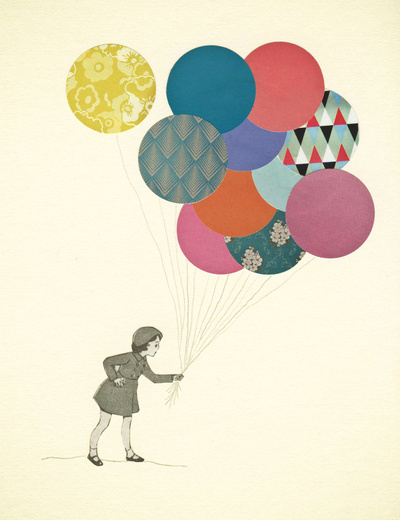 But pressing on with the day at hand and I've got some lovely images to share with you of stylist Rosie Brown's work. Rosie Brown is an art director and stylist who has worked for many interiors and lifestyle publications such as Homes & Gardens and Elle Deco. She also set up the on-line boutique Papa Stour in 2005. 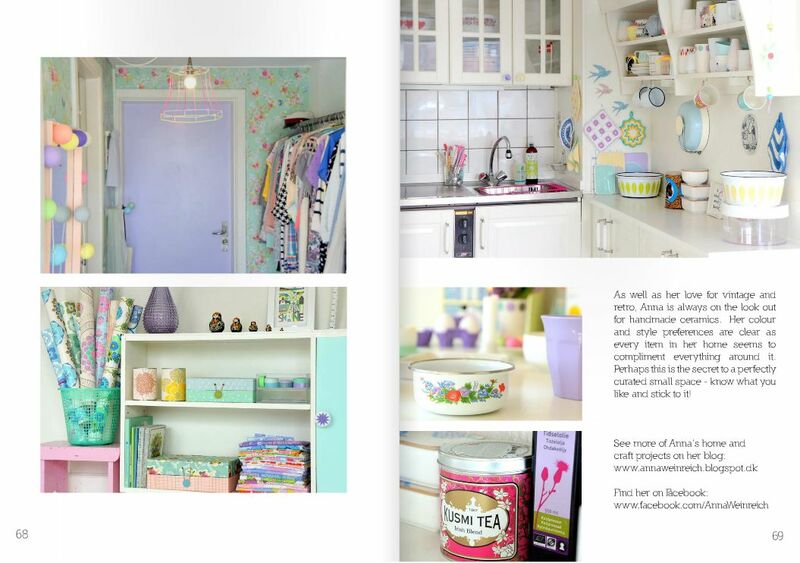 Here are a few images of her interior styling work. I especially like this last image as it makes me think of lazy Sundays drinking tea and reading the paper. Hi, I'm Laura, a twenty-something interested in interiors, design and fashion. High Street Home is my blog where I share pretty homes, cool new products and my latest fashion crushes.